The Conversion Options screen provides you with Options to automate, filter and manage your conversion process. ACT-To-Outlook offers options for the conversion to make it easier to synchronize your Outlook data with your ACT! data. The Duplicate Found Options allow you specify what you want to do when a duplicate is found. · Check for Duplicates  Indicates to the system to check for duplicates and perform smart updates. Otherwise no duplicate search is enabled. If you are doing a conversion to an empty outlook folder, uncheck this option since it speeds up processing. · Clear Duplicate Before Update. When this flag is set, ACT-To-Outlook will clear the data in the Outlook record before adding the information to the Outlook Duplicate Record. · Ignore Update Dates. When set, ACT-To-Outlook Professional does not compare whether an activity, contact, or meeting has changed in order to process the contact i.e. it simply goes ahead and process the activated fields/activities independent of whether these fields have been changed or not. The Intelligent Updater, when enabled, does not process any items before the Update Cutoff Date. This date is automatically set at the end of each successfull conversion i.e. the full conversion has to go through and then the date is set. However, users can choose to change this date at their choosing. · The Intelligent Updater will only filter the items if the contact already exists in Outlook. If the contact does not exist in Outlook, every item is then analyzed and processed for the contact. · The Intelligent Updater takes the date entered in the Cutoff date and if an existent contact does not have any changes made to it after the cutoff date, it will skip the item and go to the next one. It applies this logic to the main contact data (the last time the contact was edited) and to the last time the todo's, calls, meetings and history notes. · The Cutoff date is always set after a full processing of a lookup, group or all conversion. · If you conversion data shifts, for example, you convert a group, then a contact, then a lookup, it is not advisable that you use the Intelligent Updater since the base data changes so many items may not be converted when they should. When Intelligent Updater is used with a fixed conversion base, you will dramatically improve conversion speeds. · Add Date to Subject Line. When items are converted into Outlook, the date in ACT! is inserted in the subject line. This simplifies visual searches by date. · Convert ACT! Groups into Outlook Categories. All the groups to which the contact belongs to in ACT! and convert them into Categories in Outlook. · File Contact As:. This enables the user to specify how to create the keywords for the record in Outlook. These keywords determine how the contact is identified in the Outlook Contact Book. You must then build the FileAs string. All the ACT! fields MUST be enclosed in right parenthesis [ACT! Field] for the parsing mechanism to do it properly. Click on the Build button and the build screen is displayed. Select which fields you want to appear in your fileas screen and separate them using whatever strings you wish. Do not use square parenthesis of your own on the build string. The parenthesis are reserved for parsing the string. However, you can use any other string. Whatever you insert in the string, that is the way the contact will be entered into Outlook. · Form To Use. If you defined your own custom contact form in Outlook, enter the name here. The name of the form must match the name in Outlook. If there are any discrepancies, the conversion of the contact will not succeed. Outlook form names are generally named "IPM.Contact.FormName", where "IPM.Contact" indicates to Outlook that this is a contact form. 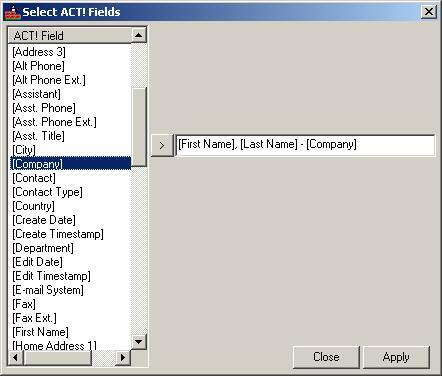 ACT-To-Outlook Professional attaches the prefix "IPM.Contact." to the name of the form in this field. Hence, you only need to enter the name of the form, in our case FormName. · Add phone number extension to Phone number. When set, this option adds the phone number extension to the end of the phone number. For example, Outlook only provides 1 field to add a phone number to. Hence, this feature will take the standard phone fields with extensions and put merge them to make one field in Outlook. · Remove Phone # Country Code. When this option is set, ACT-To-Outlook Convert professional will remove the country code specified in CC form the phone number. The reason this option is available is because ACT! provides the phone number in the format of +1 (408) 555-1212 where +1 is the country code, (408) is the area code, and 555-1212 is the phone number. Some installations of Outlook will accept this phone number. However, others will not. Hence, you can specify ACT-To-Outlook Professional to remove a specified country code. · Add Hyphen to Phone Number. Some ACT! configurations provide the phone number as a string of 7 digits i.e. 1234567 and Outlook will import those phone numbers and not add the customary hyphen to the phone number. By setting this option, you can force the phone number to have a separating hyphen on the last 4 digits before they are imported i.e. The number would look like 123-4567 therefore making it more legible. · Use Company Name when Name does not exist. Outlook requires a contact name in order for the links to function properly. This option instructs ACT-To-Outlook Professional to replace the company name in the name field of FileAs so that the contact get's saved properly and links to the contact work well. If this option is not set, the user will be queried for every instance of this problem.